A team of mathematicians has determined the ideal wing shape for fast flapping flight—a discovery that offers promise for better methods for harvesting energy from water as well as for enhancing air speed. "We can simulate biological evolution in the lab by generating a population of wings of different shapes, have them compete to achieve some desired objective, in this case, speed, and then have the best wings 'breed' to make related shapes that do even better," says Leif Ristroph, an assistant professor at New York University's Courant Institute of Mathematical Sciences and the paper's senior author. In making these determinations, the researchers conducted a series of experiments in NYU's Applied Math Lab. Here, they created 3-D-printed wings that are flapped mechanically and raced against one another, with the winners "breeding" via an evolutionary or genetic algorithm to create ever faster flyers. In order to mimic this breeding process, the researchers began the experiment with 10 different wing shapes whose propulsion speeds were measured. The algorithm then selected pairs of the fastest wings ("parents") and combined their attributes to create even-faster "daughters" that were then 3-D-printed and tested. They repeated this process to create 15 generations of wings, with each generation yielding offspring faster than the previous one. 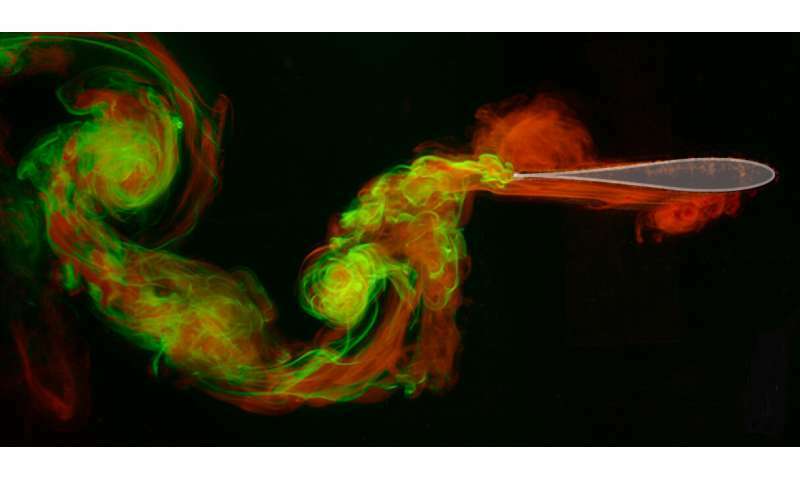 "This 'survival of the fastest' process automatically discovers a quickest teardrop-shaped wing that most effectively manipulates the flows to generate thrust," explains Ristroph. "Further, because we explored a large variety of shapes in our study, we were also able to identify exactly what aspects of the shape were most responsible for the strong performance of the fastest wings." "We view the work as a case study and proof-of-concept for a much broader class of complex engineering problems, especially those that involve objects in flows, such as streamlining the shape to minimize drag on a structure," observes Ristroph. "We think this could be used, for example, to optimize the shape of a structure for harvesting the energy in water waves." In practice the aerofoil shape is able to change its angle of attack relative to the free-stream direction and this will have a big influence on the vortex generation too. Also what about flexibility of the aerofoil?